Jim Henson! The Tank Crew enters the world of muppets and Jim Henson's history of creating fantastic characters and shows for young and old. Including: Sesame Street, The Muppet Show, The Muppet Movies, Fraggle Rock, The Dark Crystal, Dinosaurs, Rowlf, Kermit the Frog, Miss Piggy, Swedish Chef, Ernie and Bert, Cookie Monster, Grover, Gonzo, Big Bird, Fozzie Bear, Gobo, Mokey, Red, Wembley, Boober, Yoda, and so many, many more! Also in this episode a discussion of Paul Winchell, Tony Sarg, Bil Baird, Frank Oz, Dave Goelz, Timecrimes, The Grand Illusion, Gun Shows, Teabagging and more. Music by Tom Smith. 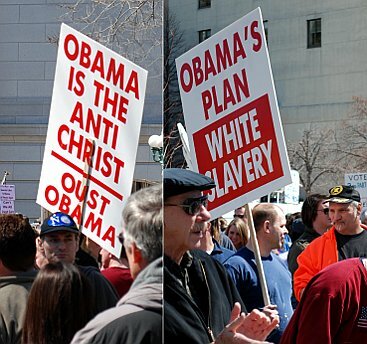 Obama hatred drives tea bagger rally in Madison, Wisconsin on April 15, 2009.